Citra Clean Concentrate Probably the only cleaner you will need and one of the most powerful and versatile cleaners available. Citra Clean may be used successfully for all types of janitorial and most industrial cleaning applications. Undiluted it will remove chewing gum and tar from carpets as well as grease, ink, adhesive and sealant from almost any surface. Powerful enough to strip polish, wax and even some graffiti from hard surfaces and flooring, yet diluted it becomes the perfect carpet and upholstery cleaner. Citra Clean is great on walls, painted surfaces, concrete and terrazzo. It will quickly remove sticky finger marks and black shoe scuffs. 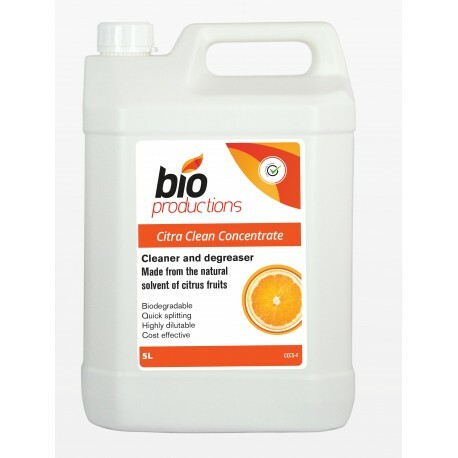 Used with a micro-fibre cloth Citra Clean Concentrate can be diluted over 200.1 to safely clean hard surfaces such as vehicles, worktops, floors and display equipment. For the caterer Citra Clean lifts grease and carbon from ovens, cleans griddles, BBQs and all types of ducting and extraction filter equipment. In the industrial market this remarkable product removes greasy grime and oil from machinery, vehicles and work areas, as well as oil and diesel spillages from drives and floors. Citra Clean out performs many cleaners dedicated to marine, agricultural and industrial applications. It is low-foaming and easily rinsed, biodegradable, highly dilutable and un-classified under CHIP and current EEC regulations. Citra Clean is also ideal for industrial applications where quick separation of the cleaning solution from the soiling is important to minimise the risk of pollution.